For the British, July 4th is a time for looking sheepishly at our feet as we're reminded of the, er, impoliteness of our ancestors. Then again, nearly every day is a time for that. For the US, it's an apparently much more festive occasion. 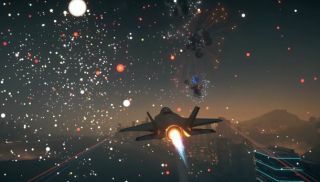 And so, in honour of the day, Battlefield 4's CTE broke out the red, blue and white fireworks, and an appropriately raucous version of The Star-Spangled Banner. You can see all the Premium-only test client's celebrations, courtesy of YouTube user 'Jackfrags' .